Hot on the heels of the highly-anticipated full-frame mirrorless cameras, the A7 and A7R, Sony has also released FIVE(!) new full-frame E mount lenses. Dubbed “FE”, these lenses were designed to match the newly released A7/A7R cameras. Among them, three are premium (read expensive) lenses with the Zeiss branding, namely the FE 55mm f/1.8 ZA Carl Zeiss Sonnar *T, FE 35mm f/2.8 ZA Carl Zeiss Sonnar T* and the FE 24-70mm f/4 ZA OSS Carl Zeiss Vario Tessar T*. The last two are an inexpensive FE 28-70mm f/3.5-5.6 OSS mid-zoom kit lens and a FE 70-200mm f/4 G OSS telephoto zoom. Along with the five new lenses, Sony has also updated one of their popular lenses into the 70-200mm f/2.8G SSM II. The lens features a faster AF speed and a new and improved ‘Nano AR’ coating said to be resistant to moisture and dust. And now, what everybody is wanting to know: the price. The EF 24-70mm f/3.5-5.6 OSS will be a kit lens to the A7 and won’t be sold separately, though we are sure it’ll somehow make its way into the channels. The 35mm f/2.8 ZA Carl Zeiss Sonnar T* will cost US$799 and be available in December 2013. The 55mm f/1.8 ZA Carl Zeiss Sonnar T* will cost US$999 and be available from January 2014. Finally, the 24-70mm f/4 ZA OSS will cost US$1199 and be available from February 2014. No pricing information is available for the 70-200mm f/4 OSS at the time of writing. 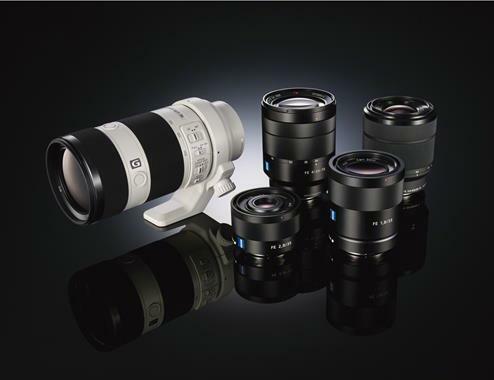 Though not as astronomical as their Leica counterparts, these Zeiss lenses still look pretty expensive. I am not sure if they are good enough to justify their cost. But like their Leica counterparts, I am sure there will be enough people clamouring over then anyway. YS: Best part is, they’re all made in Japan anyway. Also, look at the size and weight for most of the lenses. Almost all of them are equivalent to their SLR counterparts. So much for a lighter system, eh? Personally the biggest omissions are wide-angle primes: This is the area where mirrorless lenses will be smaller and lighter due to not needing a retrofocus design. Without them the new system is just another case of small camera with big lenses – a Sony favourite, it seems.